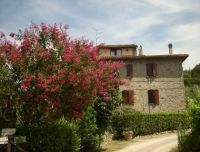 Our B & B is located in the green countryside between Umbria and Tuscany,at the foot of the Appennino and in front of one of the most beautiful historical town in Tuscany: Cortona (also set of the book and movie "Under the Tuscan Sun"). The hallmark of our B & B is the friendliness and warmth that only a family can give. The large stones of the stairs and the big walls that the house is made of, the old and massive wooden beams in the ceiling, the warm light that floods in through the windows and the flame of the old fireplace, they all reassure and give off a sense of peace and security. The sole outside noise you will hear here are birdsongs, the wind that flows through the branches of the large trees and the chatter and laughter of our neighbors. Cortona is the closest, just 6 km from our B & B. Within a radius of 30-90 km you may then find: Perugia, Gubbio, Citta di Castello, De Ruta, Assisi, Foligno, Spoleto, Norcia, Città della Pieve, Siena, Montalcino, Santantimo with its famous abbey, Monte Oliveto, Arezzo, Florence and others. Our B&B is not far from the Trasimeno Lake (13km), with its three beautiful islands, the towns that surround it and the near scenic routes such as the path of the battle of Trasimeno, fought between the Punic Hannibal and the Roman army, or the cycling route that developes around the lake. Hikers can walk from our B & B over to the lake along a road that runs through the woods to the top of a hill and then descend to the beach of Lido di Tuoro, this path offers a splendid view on the valley beneath Cortona and of the lake and its three islands and intersects with the archaeological trail of Hannibal. In summer, guests can take a nice walk in the woods around our B&B, go swom to the lake, and anjoy the many festivals organized all around us for food and/or music. Even on a rainy day, there are many things you can do: visit museums, old wineries, wellness Centers, Thermal Spas and more.